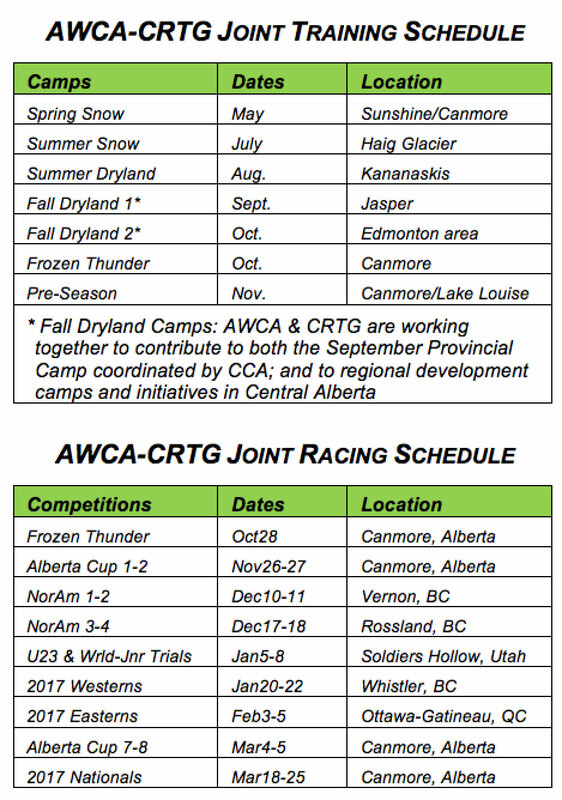 The Alberta World Cup Academy (AWCA) and the Capital Region Training Group (CRTG) are pleased to announce that they are entering into their 3rd year of a formal partnership. In addition to an annual financial contribution to AWCA, the Capital Region Training Group brings to the partnership volunteer and professional human resources; equipment and supplies; administrative and managerial expertise; as well as a close link to high performance athletes based in Central Alberta who are receiving athletic preparations well aligned with the AWCA and national sport system. The Alberta World Cup Academy brings to the partnership excellent national level information resources on current high performance cross country ski training methods; excellent professional technical expertise; and a seamless link to training and competition linkages with other national level athletes from across Canada. The Academy and CRTG partnership has already shown positive provincial results. In 2014-2015 CRTG athletes earned 3 of the 5 men’s positions on Team Alberta’s Canada Games Team. And last year 6 of the top 8 Alberta male athletes from Central and Northern Alberta were either AWCA athletes (1) or CRTG athletes (5). And these athletes have also been actively giving back to the provincial development programs as well, through either taking part in or leading various provincial and/or regional training camps over the last 2 years. “The Academy and CRTG partnership is positive example of how to improve alignment and linkages between the club system and the National Team systems,” says Pierre Lafontaine, Chief Executive Officer of Cross Country Canada.